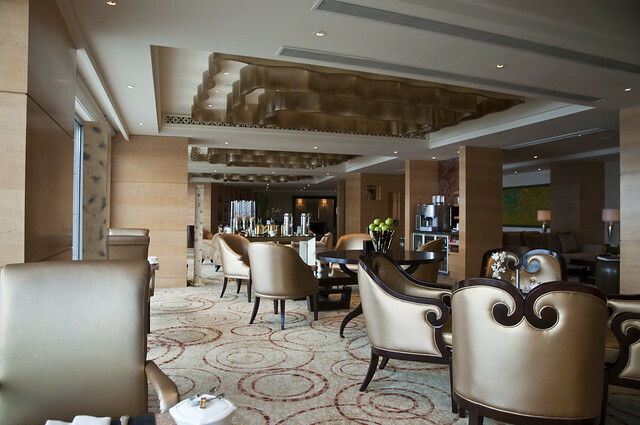 With such a luxurious room at the Fairmont Yangcheng Lake, I woke up pretty late before heading down to the Gold Lounge for some breakfast. We seemed to the be the only ones having breakfast at that time of the day until I noticed that there was an enclosed meeting room occupied by 2 person who seemed to be doing work on Excel. Well at least they get to enjoy the charming lake view too! 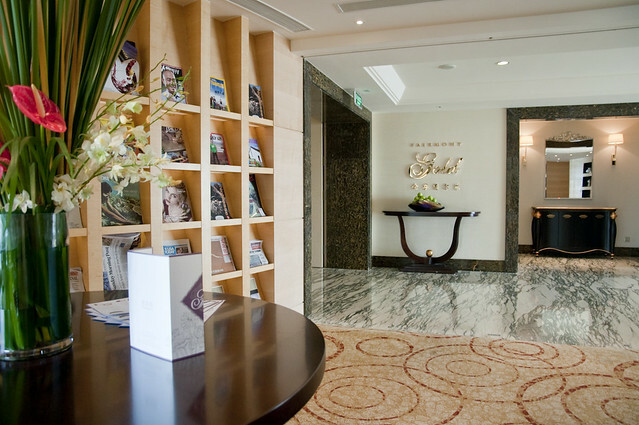 Breakfast at the Gold Lounge was great with choices of the usual eggs, bacons, and sausages, as well as a Chinese option of porridge with peanuts, pork floss and pickled vegetables. There were also an assortment of danish pastries, toast, salads and fruits. I had a nice breakfast and even though I ordered coffee, I thought the coffee in the lounge was superfluous since Nespresso machines are available in the room. Which meant I did not finish my cup of coffee and went back to the room for a cup of Nespresso. We chose to depart the hotel at around 11am as that would provide us time till night time. This left me some time to explore the grounds of the hotel as well as take a walk around the lake side. The hotel provides a really nice activity and hotel grounds map. The hotel has a small pool by the lakeside and a nice landscaped garden along with several jogging tracks which leads to an activity centre with facilities like tennis, basketball, rock-climbing wall, fishing and even a golf putting course. 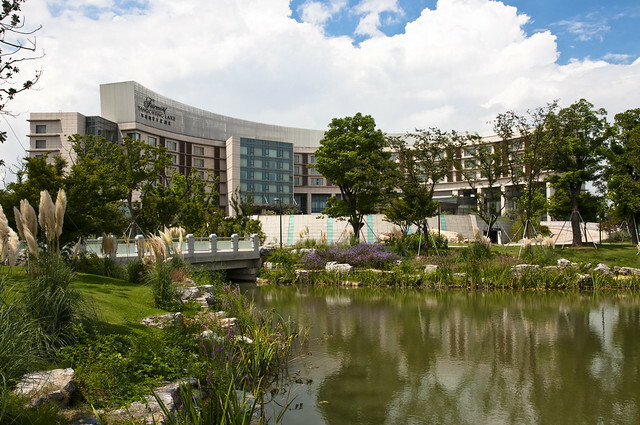 There are also bicycles for rental and the hotel would do well to promote itself to wealthy urban residents of Shanghai, Suzhou and Nanjing, especially with the ease of connections via high-speed rail. I even got to find some pomegranate trees in the hotel grounds which was lushly decorated with trees and flowers of all kinds! A landscape worthy of a 5-star resort! After some photo-taking, the sun was really hot which meant I returned to the hotel room for a short rest. The amazing thing that happened was shortly after this burst of sunlight, dark clouds came in to cover it up as quickly as it can, which meant that by the time we got to the lobby to board the rental car, it was raining. The car provided was a Buick MPV and came equipped with bottled mineral water, newspapers and magazines which made it even more convenient for the road trip to Suzhou. The concierge also gave recommended itineraries after indicating to him on the attractions we were keen to visit for the day. By the time we left the hotel compounds, it was raining cats and dogs, similar to a tropical thunderstorm. Of course it made me wonder on the viability of touring the classical gardens of Suzhou. However upon reaching the outskirts of Suzhou, the rain seemed to clear and it turned to be a cloudy day. 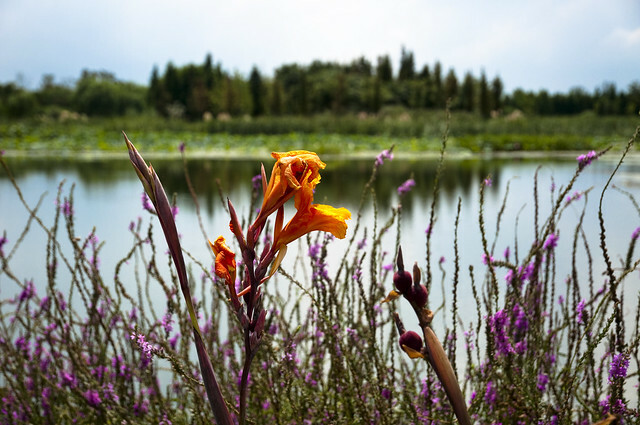 Our time in Suzhou thus limited us to a visit to just one Chinese garden, and I made the choice to visit the Humble Administrator’s Garden or also known as Zhuozheng Yuan 拙政圓. 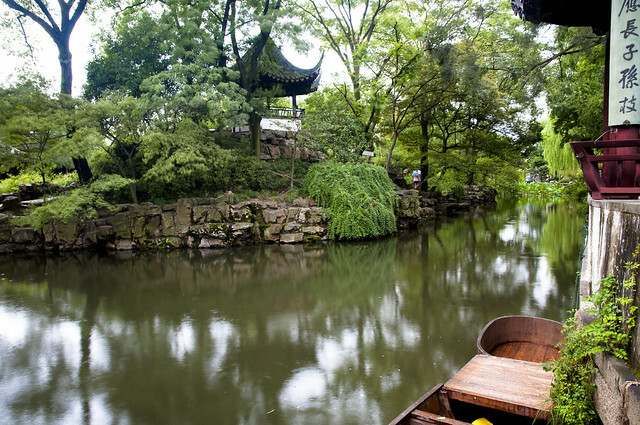 This garden is one of the largest in Suzhou and perhaps also the most visited due to its location in the city centre and being located beside the Suzhou Museum, a structure designed by renowned architect I.M. Pei. The driver dropped us at a pedestrian-only street which was perhaps a 3 minute walk away to the main entrance of the Humble Administrator’s Garden. It was drizzling at that time and with the hotel’s car, we were provided umbrellas to use for the walk! Another perk of renting the car from the hotel I guess! A massive archway greets visitors to the garden, and the drizzle creates a distinct atmosphere for our visit. 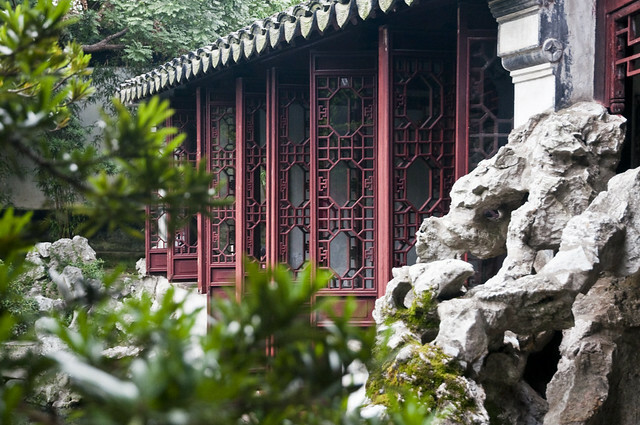 The garden which was initially smaller in size was built during the Tang Dynasty by a scholar for his residence, and became a temple in the Yuan Dynasty, only to finally receive its present name from its possession by a Ming official named Wang Xiancheng. After the Ming Dynasty fell, the garden was separated and was once the residence of the author of the Dream of Red Chambers – Cao Xueqin. Whatever it is, this garden is definitely a residence of a wealthy and influential family, given its large scale and numerous chambers. A central lake occupies a significant portion of the garden and several pavilions are scattered around the gardens that function as a place of entertainment, relaxation and meditation. Small islets and grottoes complete the maze-like effect of this garden. The first section of the gardens we entered was the eastern block which is made up of several large pavilions that function as one chamber around a pond filled with lotus. Lush trees provide extensive shade over the light drizzle and there was several open air gardens. We went round the first section to reach a slightly more isolated complex of buildings known as the House of Sweet Fragrant Rice. My guess was that this part of the residence would be a kitchen or storage area of sorts as it was separated from the main garden compound with a wall. We wouldn’t want to see firewood and cooking utensils to clutter the view of the gardens, wouldn’t we? From this area, we moved onto the central section which was one of the more beautiful part of the garden. This area had another larger lake with 2 small islets joined together by stone pathways. A pavilion stands atop each of the islets and one of the most magnificent chambers in the garden faces the lakes with the 2 islets. The view from a corner pavilion called the Green Ripple Pavilion provided a serene view over the garden. Its secluded position also meant an area where one could find solace within the gardens. 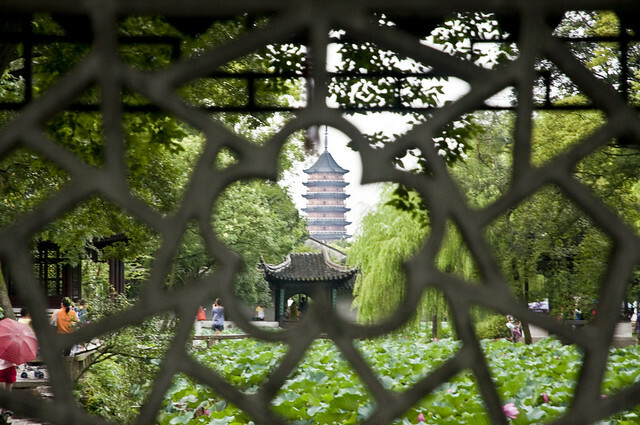 Several tour guides were conducting tours across the gardens on the day we visited and we got to know that one of the stone windows provided a nice view of one of Suzhou’s tallest pagoda. With the crowds congregating in this area, it destroyed the function of the garden somehow and we moved on towards the smaller pathways to venture the nook and cranny of this garden. Turns out there are several pathways that leads to edges of the garden and as the pathways were slanted upwards, we got to view some parts of the garden from an elevated position. As mentioned earlier, visitors could also check out some of the major chambers in this area, one of the largest being the Hall of Distant Fragrance. Some of these halls function as dining venues or even studies for the residents. It is here that some of China’s famous artists came up with paintings and poets are able to weave lyrics. It would be easy to just sit down on one of the balconies and sip on some nice Longjing. Another area which I truly enjoyed was the Tower of Reflection 倒影樓 located on the north-western section of the garden. The tower was connected to the main lake through a covered walkway which provides some sort of privacy to the users of this tower, and had a row of windows which open out to a small part of the lake with a view of the trees and the covered walkway. The trees and the walkway creates a sort of alcove for the tower and made this location perfect for thinking and ‘reflection’, which would explain how it got its name. From the tower we headed south for a short visit to cover some of the other chambers before calling it a day and to head for lunch. 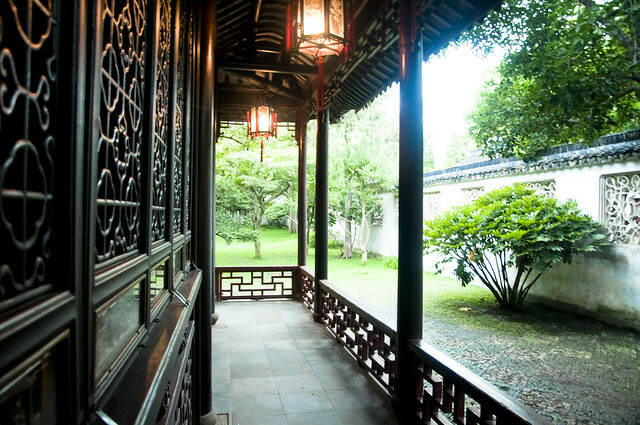 We sort of skimmed through the rest of the areas and returned to the eastern section of the gardens to enter a small exhibit area detailing the classic gardens in Suzhou and their significance in Chinese architecture, art and history. One feature which I found interesting was the use of sculpted stones, the use of distinct shapes for their windows, and doorway, such as the moon gates scattered around the gardens. There was also the curved roof at the edges which was provided some prominence and differentiation to the architecture in this part of China. Walking out of the garden, we passed by a mansion called Zhongwang Fu or literally called the Residence of the Loyal Prince. The resident of this mansion was, however, not a prince but a peasant-turned-rebel leader of the Taiping Heavenly movement. There was also the Suzhou Museum on the way back which we also skipped this time round. After giving a call to the driver, we waited at the location where he dropped us off. As we had passed by a busy part of Suzhou on the way to the gardens, we enquired on the availability of dining choices there. The driver was knowledgeable enough on that location and concurred that it was a good place to find restaurants and eateries. Initially we had wanted to eat at one of the landmark restaurants in Suzhou serving Jiangnan specialty cuisine, but because it was past lunch hour (around 2.30pm) by the time we reached, the restaurant is closed, so we had to settle for KFC for a quick meal before returning on our road trip to Tongli 同里. However before leaving the area, we took a short walk around the area and discovered by chance this Taoist Temple called the Temple of Mysteries or 玄妙觀 which dates back to the Sui Period. Historically, this temple has been a place of gathering for travelling magicians and craftsmen, and had several shrines in the temple complex, including one dedicated to the God of Fortune. 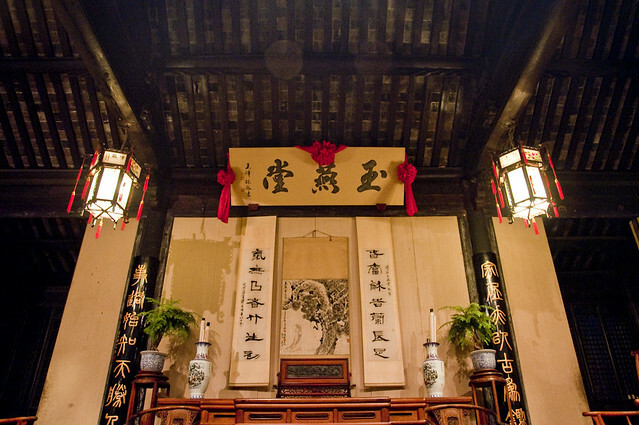 The main shrine called Sanqing Hall or 三清殿 is worth a look if one is in the vicinity. The drive towards Tongli took around 40 minutes, though the driver seemed to got lost on the way there. It seems like he forgot about the turn because we did arrive in Tongli without much delay. 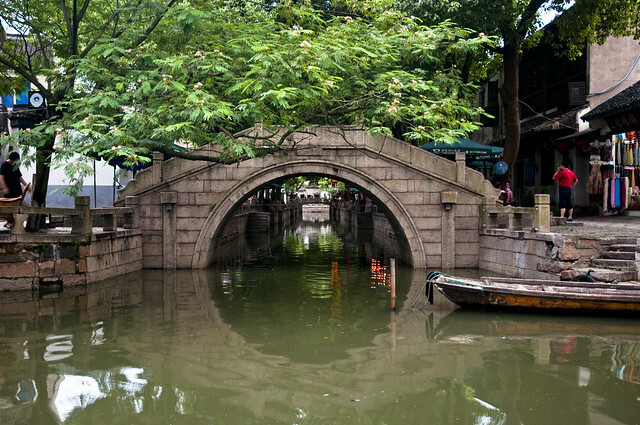 The area around Suzhou is well known not just for the gardens but also the numerous water village which still retained the ancient architecture and showed visitors the rustic charm of a water village unlike that of Venice. It was also one of the reason which drew me to this area for a visit. Amongst the water villages in the area, Zhouzhuang 周莊 is perhaps the most famous, but my cousin in Shanghai suggested a visit to Tongli which was quieter and received less visitors. Having checked that Zhouzhuang still remains open till night time, and Tongli doesn’t, we visited Tongli first. 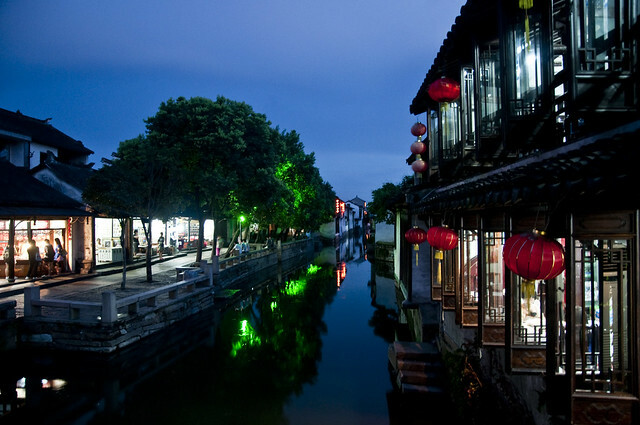 The water village of Tongli is still home to residents and visitors could just walk around the village to soak in the sights, though if one is in the mood for further exploration, they could buy a ticket to visit several points of interest. We got a ticket for admission but due to our arrival close to 4pm, and given that most of the sights close by 5pm, there was little time for us to explore everything. We just settled on the main sight of the Tuisi Garden 退思圓. The garden was much smaller compared to the Humble Administrator’s Garden. 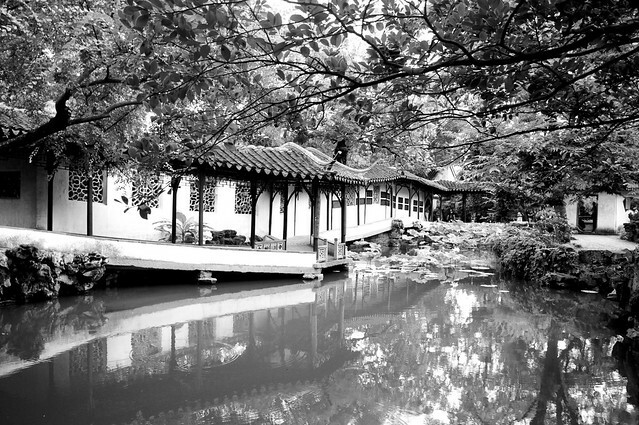 There was a small courtyard separating the living quarters from the garden, and similar to the Humble Administrator’s Garden, there was a small lake and a boat-shaped platform for performances. Around the lake was decorative stones in various distinct shapes, providing a sharp contrast with the red coloured windows. 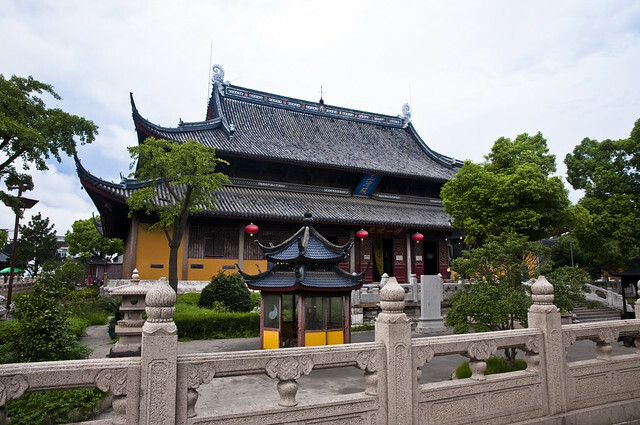 Other attractions in Tongli besides the Tuisi Garden are several more gardens and residences, pagodas and halls, as well as a Chinese Sexual Culture Museum, perhaps one of the first in China. It has to be noted that costs for the latter is an additional fee on top of the combined ticket. Having had enough of exploring gardens for a day, we took the rest of the time to tour the water village proper, heading towards the Three-Bridges area. This area is so named due to the presence of three stone bridges named the Taiping 太平 (Peace), Jili 吉利(Fortune), and Changqing 長慶 (Celebration) Bridge. Ancient traditions has it that newly married couples have to cross the three bridges for peace, fortune and happiness. It is also one of the most charming part of the village and one could see several tourist boats plying this area. There were also several cafes, tea-houses and souvenir stands which we passed by on the way to this area. It seems that this place will become crowded with tourists in the not too far future. Reminds me somewhat of Venice and the water village of Tongli definitely has left its own distinct impression on me. Returning to the main entrance, we got to see the warm orange glow of the sun setting across Tongli before leaving the water village to visit its larger contemporary – Zhouzhuang. By the time we arrived in Zhouzhuang, the sky had turned dark blue, though we got cheaper entry tickets to the water village after 6pm. The village unlike Tongli, was much larger in scale and had more shops. Though at the time we were there, the place seems quiet and empty until we met most of the crowds touring the centre of the village. 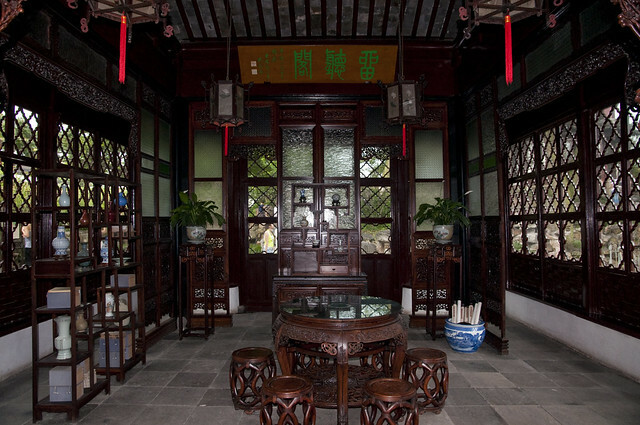 The two main attractions still open at night were mansions of 2 wealthy residents of Zhouzhuang from the Zhang and Shen families. Unlike Tongli, Zhouzhuang was much larger and it was more difficult to navigate around the village without a real map, with our directions based on the mini map on the entrance ticket. Luckily for us, there was wooden signboards indicating directions to the main points of interest. We got to the Zhang and Shen residence for a tour but along the way, my brother had to lose his entrance ticket which meant that I would be the only one entering. As a result I took a quick look in each residence and because these residence weren’t extensive, they provided an authentic look into the residence of the wealthy during that time. Since it was already late and time for dinner, we noticed several restaurants in Zhouzhuang but after seeing that they wash their dishes on the canal side, somehow we decided against dinner in the village. By this time, neon lights have illuminated the sides of the canals and the trees lining the pathways of the village. For this reason, a visit to Zhouzhuang was worth the effort, since I think this is the only water village in the area with attractions open even in the night time. Since we passed on dinner in the village and we weren’t that hungry as a result of the late lunch, we headed back to the hotel, but not before stopping at a souvenir stall to purchase some local snacks like peanut candies and sesame snacks. These candies are apparently a delicacy in this part of China, though I found them too sweet for my liking. By the time we returned safely to the hotel, it was close to 9pm, and we headed straight to the room for a much needed shower and rest. After the shower, we got a bit hungry and wanted to order room service since a trip out would be a hassle considering the isolated location of the hotel. This seems to be the major drawback of staying in this hotel, and the room service menu also seems limited by nightfall, since the choices we wanted from the Chinese menu were offered only while the Chinese restaurant is open. Which meant we had to settle for fried rice and pan fried gyoza, though one thing I liked about the room service was how they would be able to deliver the food at the time mentioned during the order. Exactly half an hour later, the food came, and we had enough time in between to borrow the DVD of Harry Potter and the Sorcerer’s Stone along with obtaining chilled cans of herbal tea for our drinks from the Gold Lounge! Ah, the wonders of staying in a Fairmont Gold Room! Thanks to the Fairmont Gold Concierge for the wonderful service! Suzhou is such a beautiful place! Great post. I love all the photos too. Follow my post on Zhouzhuang.